When I started redoing our master suite, I knew that I wanted to decorate the space with blue bathroom accessories, I just wasn't sure how I would design the rest of the room around it. As you can probably tell, we decided to keep the original flooring because it is quite neutral, but replaced the countertops and bathtub surround with a new faux marble solid surface product that gives the classic look, but with more durability. We also replaced our old duel vanity with this new beautiful white shaker style unit that blends perfectly with the bathroom sets we selected as well as the marble and blue palette that we had chosen. When it came to wall coverings, I had originally never considered anything other than your typical bathroom paint. 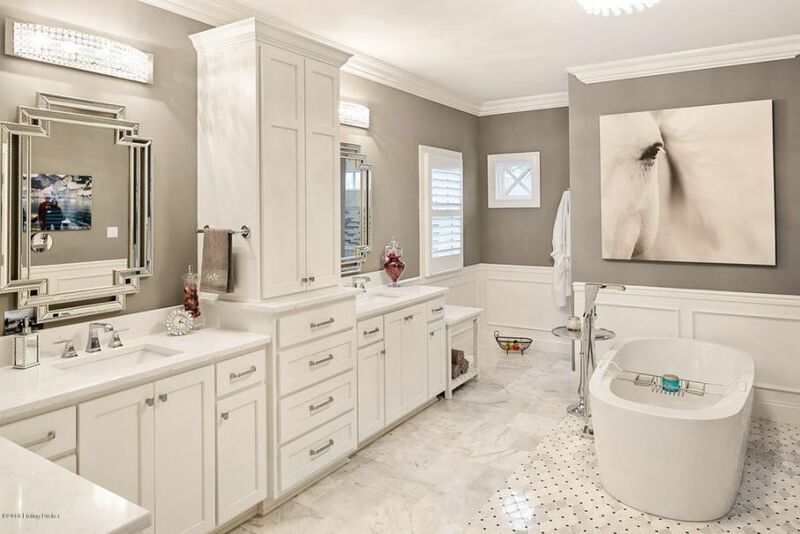 My family and friends know me as someone who has a great eye for design, but that struggles with certain finishing details in the decorating process -- primarily in selecting bathroom fixtures. 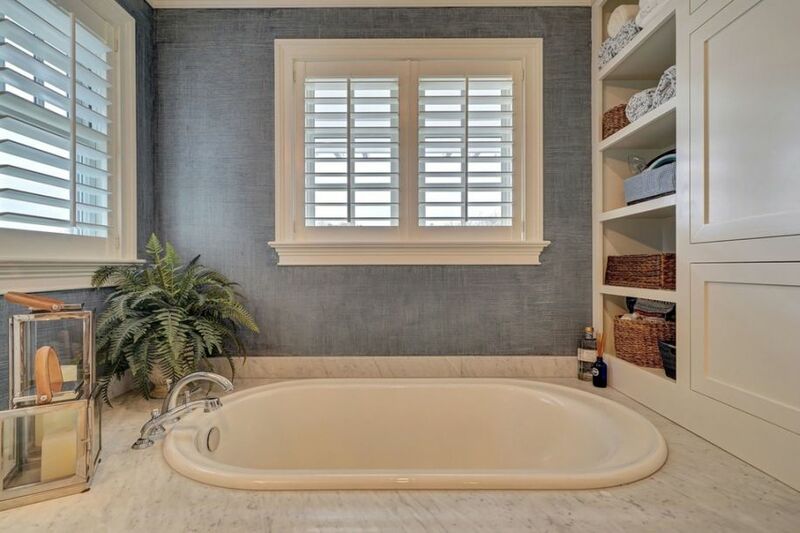 I have renovated several rooms in the past that turned out perfectly gorgeous, only to be rendered a bit odd looking because I selected bath accessory sets the just looked "off." One of my famous mishaps was adding gold faucets in a grey and black contemporary style bathroom for my son -- whoops. This room however, was one of my crowning achievements because everything goes perfectly together, even the bathroom accessories set. Many people think that designing the main areas of bathrooms is hard (like tile choices, shower layout, vanity placement). 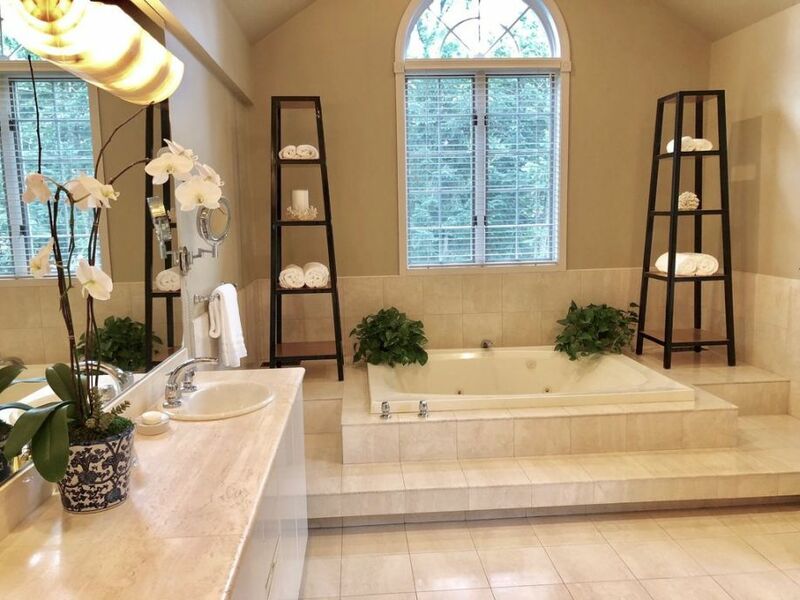 I completely disagree -- for me the most challenging aspect is actually when it comes time to chose bath accessories to accent the space you have created. This may sound odd since pieces like a bathroom accessories set seem quite trivial in comparison to high dollar decisions like which floor tile to choice or the type of shower to install. But I think that the right bathroom decor sets can actually make or break a design. All of those other elements merely provide the foundation to the overall look of the space, but decorative accessories really anchor the style. 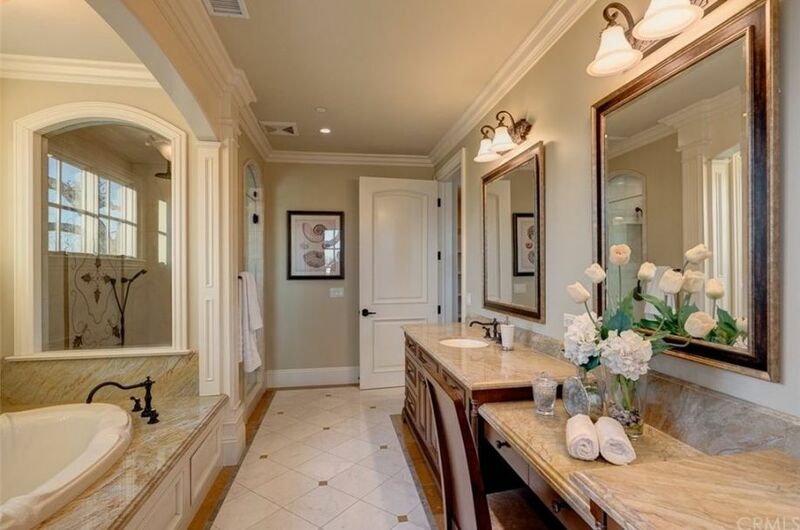 I have been searching far and wide for bathroom themes that would be a nice accent to my slightly contemporary style home but that still exude an old world elegance that I love. This master bath is the perfect combination of all of these things, and I think will be the inspiration for my new space. I love how the paint palette is simple yet warm and provides a great foundation against the beautiful marble tile and gold bathroom accessories. I would never have thought to pair bronze metal with these two items but I actually think the use of bronze in the light fixtures and door accessories works very well with the overall design. I also love how they kept the bathroom accessories set quite simple and only added a few pieces that enhance, rather than take away from the minimalistic design. I think that the bathroom accessories set we found at Home Goods is the perfect accent to our tropical themed master overlooking the palm trees in our backyard. We wanted to incorporate bathroom decor ideas that were reminiscent of the beautiful tropical surroundings of our South Florida home without being too cliche. I think the mercury glass candlesticks and decorative ball set placed in a hand carved wooden trough were the perfect choice to accomplish this. Originally we had considering using all black bathroom accessories to coordinate with the dark granite of the jacuzzi surround, but ultimately felt it would create much too modern a look. 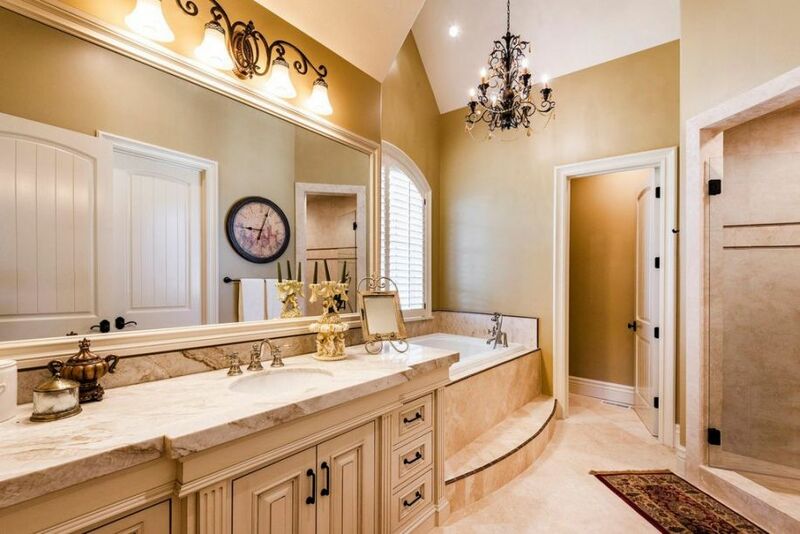 In the design world, I find that bathroom decor is often overlooked when you think about the style of an entire home. While I suppose that this is easy to understand since they are often much smaller spaces, I think that selecting the right bathroom accessories set is just as important as the accent pieces you choose for the kitchen. Decorative accents serve just as large a purpose in these rooms as anywhere else and, for this reason, putting together bathroom collections is often a huge part of my design process. This beautiful white and marble design was actually inspired by the lovely Art Deco style mirrors hanging above each vanity station. Their classic style reminded me of old Hollywood glamour and served as the basis for the design.